El Jardin Latino – Cinco de Mayo and all that. It’s Cinco de Mayo. Who cares that Mexican people don’t celebrate the defeat of the French at Puebla? I will celebrate by eating Peruvian style chicken at a “mexican cafe”. 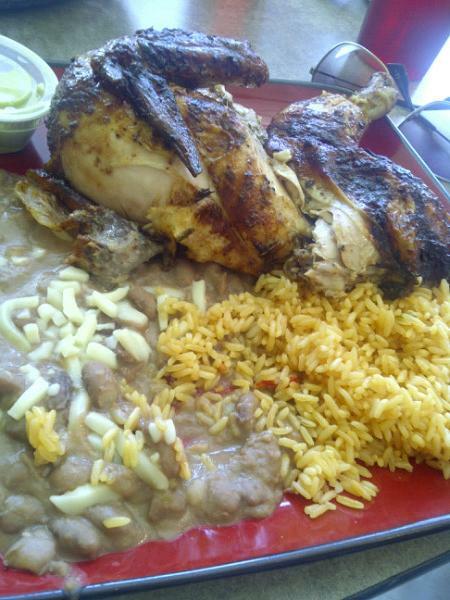 I went to El Jardin Latino for lunch today and got 1/2 of a rotisserie chicken, rice and beans for $7.99. It was very good food. I gave it 5 out of 6 points. The chicken was a huge portion of food for the price and it was impossible to resist eating the skin (yep, I know it’s bad for me). 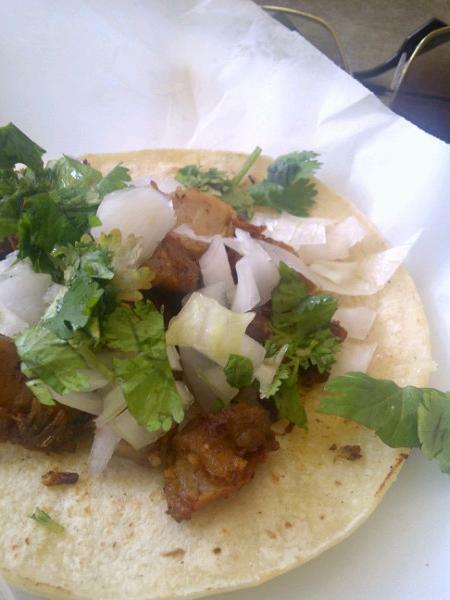 I also got one Carnitas (pork belly) taco. The carnitas were a little dried out – but i’d definitely come back for the chicken. My friend, Ron, just forwarded me your link. We found the Peruvian chicken a couple of weeks ago and luv it. I’m think’n your food style is right awn w/ my/our style. Keep the reviews coming. Would you be able to put some captions on your FB photos? Happy Food Adventures. Thanks!!! Thanks! Yeah, captions are a good idea. I put up all of the photos on the site here as well. The FB page is a new venture for me.